Learning to grow, harvest and eat fruit and vegetables is an opportunity we give to all our children. Classes are timetabled weekly to use the allotment and poly tunnel and each year grow, harvest and cook potatoes, leeks, onions, cabbage and lettuce as well as many fruits. We are currently growing our very own grape vine! 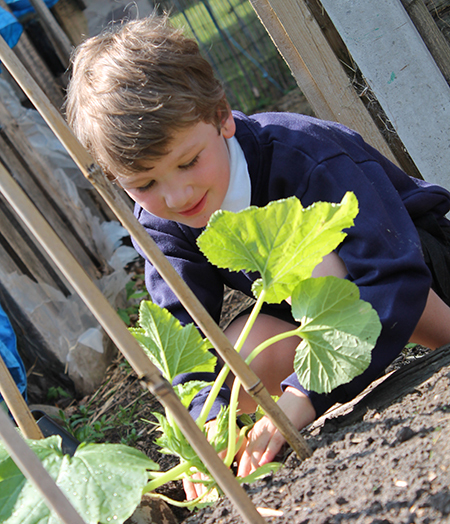 Our ‘Allotment Club’, run by Mr Moss, gives children another chance at getting hands-on in the soil! Throughout the year, we make the best possible use of our seasonal produce by inviting the community to a unique dining experience – where our children transform the produce into a range of delicious dishes: Regular favourites include: Summertime strawberries and cream picnic, Spring vegetable bake and hearty Autumn stew with home-made bread followed by apple pie from our own orchard!